LAKE ATITLAN, Guatemala –We ate our way around the lake today and enjoyed every minute of it — traveling by small motor boat and stopping at a few different towns to enjoy the food of Lake Atitlan. Our first stop was at San Antonio Palopo, known for its ceramics. Then we hit Santiago de Atitlan, the largest town on the lake. There we visited a crowded, but wonderful market that serves the town’s population … it is not on the beaten path so we were able to try some very local items such as Patin (dried salted meat – sort of like a meaty beef jerky in a spicy tomato sauce served steamed in a corn husk and eaten with tortillas) and green mangos with lime juice, ground chili pepper and pumpkin seeds. While in Santiago we visited San Simon (some call him Maximon and the Mayans call him Rilaj Maam) a god who receives offerings in return for blessings. He is a wooden icon who is moved from house to house in the city to prevent the enemies of the Mayan people from destroying him. He must be seen to be believed. Next we stopped at San Juan la Laguna – a small town known for its cooperatives of artists and skilled workers. We bought some lovely weavings at a cooperative whose slogan says it all, “Empowering Women of San Juan La Laguna through the art of weaving.” All fabrics are woven from cotton grown in the gardens of the co-op members and are died with natural colors coming from plants also grown locally. We learned that the natural cotton comes in three colors: white (which is the only one that can be dyed); cacao – a mocha color; and café de madre- a coffee color that is believed to represent Mother Earth and the color of the skin of Mayan women. Then we walked across the street to a medicinal garden, where we got a guided tour of what is being grown and what it is used for. I bought some natural insect repellent and bite healer since any mosquito within a 100 mile radius always seems to find me. Our last stop of the day of enjoying the food of Lake Atitlan was at San Marco – a “new age” locale. Many people go there for yoga and meditation lessons. It is extremely tranquil and transplants from many parts of the world have set up small shops and teach various lessons in holistic lifestyles. The locals refer to San Marco as a “hippie town” although I saw more Rastas than hippies (of course I am old enough to remember the Hippie movement, so perhaps I am being too literal). We had a fabulous lunch right on the water at a restaurant run by a Frenchman and his Guatemalan wife. I enjoyed Polo a la Crema — locally raised chicken sautéed in a salsa with white wine and cream. 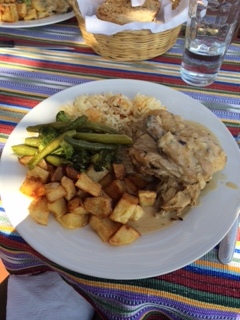 It was served with a vegetable medley, rice and potatoes – I wanted to lick the plate because the sauce was so delicious. 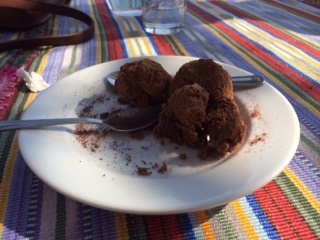 For dessert we had truffles made by the chef – not like what you get at Godiva, more rustic and in a strange way much richer – the cacao beans were ground by hand at the restaurant, giving the truffles a more texturized consistency. They mixed the chocolate with sweet raisins and a ton of butter. The truffles were sweet in a dark chocolate way, not at all cloying. A perfect end to our meal. When we returned home Angela taught us how to make Guatemalan tamales. The next blog will contain the recipe and some pictures. These are the best tamales you have ever tasted….I don’t like tamales as a general rule, but these … yum!